Green tea is a fantastic base for creating your own tea blends because it has a relatively mild flavor that can pair very well with all kinds of other roots, fruit, spices and flowers that are often used in tea blends. Usually, we experiment with teas by trying the variety available at the local coffee shop, since opportunities to blend your own teas are few and far between. I recently spotted an Green Herbal Tea Kit that will give you the change to do just that in your own home. 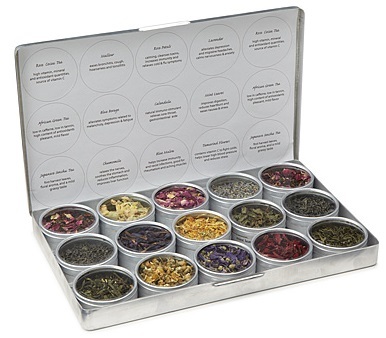 The kit includes three types of organic green tea from Japan, India, and Sri Lanka, and nine different herbs that you can blend with them. The herbs include lavender, calendula, tamarind and mint, just to name a few. You can mix based on flavor, but the health benefits of each herb are also listed, so you can also try mixing teas based on their positive health benefits. Mint, for instance, “improves digestion, reduces heartburn and eases nausea and stress.” Reusable corn silk tea bags are included for brewing, although any loose-leaf tea infuser will let you try your blends out.